To begin with, we made the crossing over to Apo from Dumaguete in a large pump boat. The boat held about 20 of us snorkelers, plus 5 crew. I packed everything you could possibly need for such a trip: mask, snorkel, sunscreen, snacks, extra water, towel, another towel, I was set to go... except for the dramamine. Yep, I was definitely feeling the waves and have learned a valuable lesson. To my defense, the waves were pretty big and even the captain said he hasn't sailed on waves that were that big in a while. I guess a huge typhoon is heading toward the island of Luzon, and we were getting small rain bands from it. The day was just beginning though and after a 45 minute boat ride we came to Apo. The island looks amazing. 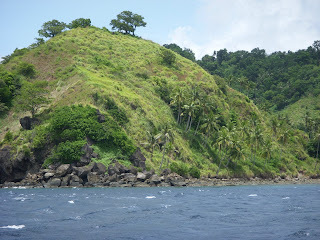 It was very mountainous and covered with coconut trees. 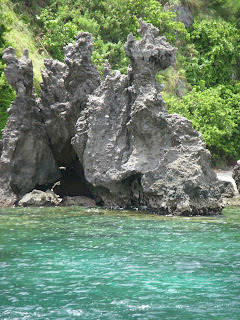 There were also many rock formations along the coast and beaches with lighter colored sand. The water was turqouois where there was not coral; very postcard looking! I was able to see all types of coral, starfish, jelly fish, angel fish, and many more fish that I can't even name. It was my first time snorkeling and I think I was able to experience the best you can possibly get. The area is a marine sanctuary and you could definitely tell by its pristine condition. So as the song goes, "Such wonderful things around you, what more is you lookin' for?" Wow, I love to snorkel! 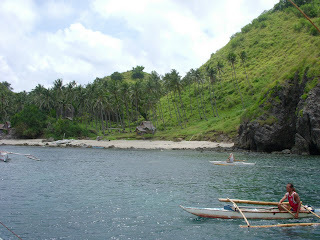 I never knew Apo Island offers a great site for snorkeling. 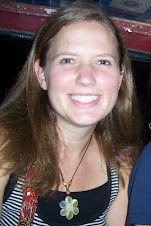 I do my snorkeling in Palawan which also has great corals.